Area total: 61.2 sq. km. ; about one-third the size of Washington, DC. 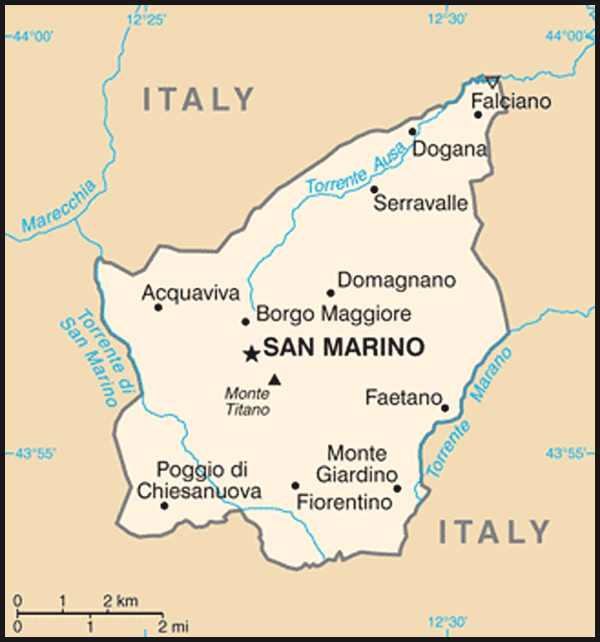 Cities: Capital: San Marino (pop. 4,377). Other cities — Serravalle, Borgo Maggiore, Domagnano. Nationality: Noun and adjective — Sammarinese. Health: Infant mortality rate (2010): 2.99/1,000 live birth rates. Life expectancy (2009) — 80.9 years for men and 86.0 years for women. Work force (April 2011): 22,374. Constitution: October 8, 1600, electoral law of 1926 and manuscript of rights (1974) serve some of the functions of the Constitution. Branches: Executive: Captains Regent (co-chiefs of state); Congress of State (cabinet) elected by the Great and General Council; Secretary of State for Foreign and Political Affairs (head of government). Legislative — unicameral parliament: 60-member Great and General Council. Judicial — Council of Twelve. Political parties: Christian Democratic Party of San Marino, Party of Socialists and Democrats, National Alliance, Popular Alliance, United Left, New Socialist Party, We Sammarinesi, Sammarinesi for Freedom, and Democrats of the Center. GDP (2009): Euros 1.102 billion (approx. $1.54 billion). Per capita GNP (2009): Euros 24,990 (approx. $34,830). Agriculture: Products: wheat, grapes, maize, olives, cattle, pigs, horses, meat, cheese, hides. Industry: Types: tourism, textiles, electronics, ceramics, cement, wine. Trade: Exports (2008): 2.80 billion Euros (approx. $3.9 billion). 90% to Italy. Imports (2008) — 2.60 billion Euros (approx. $3.6 billion): manufactured goods, food. Partners — Italy, Western Europe, Eastern Europe, South America, China, Taiwan. San Marino has been occupied by foreign militaries twice in its history, both for only short periods of time. In 1503, Cesare Borgia, known as Valentino, occupied the republic until his death several months later. In 1739, Cardinal Alberoni used military force to occupy the country. Civil disobedience was used to protest his occupation, and clandestine notes sent to the Pope to obtain justice were answered by the Pope's recognition of San Marino's rights and restoration of San Marino's independence. The State Congress, composed of 10 Secretaries, wields executive power. The 10 Secretaries are (1) Secretary of State for Foreign and Political Affairs, Telecommunications, and Transportation; (2) Secretary of State for Internal Affairs and Civil Defense; (3) Secretary of State for Finance, Budget, and Relations with the State Philatelic and Numismatic Office; (4) Secretary of State for Education, Culture, University and Social Affairs; (5) Secretary of State for Territory, Environment and Agriculture; (6) Secretary of State for Health and Social Security; (7) Secretary of State for Industry and Trade; (8) Secretary of State for Tourism, Sport, Economic Planning, and Relations with the Azienda Autonoma di Stato for Services; (9) Secretary of State for Justice, Information, and Relations with City Governments; and (10) Secretary of State for Labor and Cooperation. The Legislative body consists of the Great and General Council, the parliament, and a unicameral Chamber. The members of parliament are usually elected every 5 years and are in charge of legislation, justice, and the administration of jurisdiction. In addition, they are tasked with electing the Captains Regent, the State Congress, the Council of Twelve, the Advising Commission, and the Government Unions once the Council nominates them. Parliament also has the power to ratify contracts with other countries. The parliament is divided into five different Advising Commissions consisting of 15 councils which examine, propose, and discuss the implementation of new laws that are on being submitted to the Great and General Council. The judiciary is composed of the commissioner of the law, the judging magistrate, the appellate judge, the juvenile court, and the judge of last appeal. The commissioner tries civil and penal cases with penalties not exceeding a 3-year sentence. The judging magistrates, who are appointed by parliament for a 3-year term and can be indefinitely reappointed, preside over all other cases. Reform legislation, enacted in 2004, no longer requires that the country's lower court judges be noncitizens; however, most lower court judges remained Italian citizens. A local conciliation judge handles cases of minor importance. Under the same reform, the final court of review is the judge of the last appeal. In civil matters, this judge confirms or overrules either the lower court judgment or an appellate decision; in criminal matters, he judges on the legitimacy of detention measures and on the enforcement of a judgment. On April 28, 2005 a new act established the country's constitutional court with the following functions: 1) to verify that laws, acts, and traditions that are given the force of law conform to constitutional precepts; 2) to verify the admissibility of a referendum; 3) to decide on conflicts between constitutional institutions; 4) to control the activity of the Captains Regent. The court is composed of three standing judges and three alternate judges. They are selected by the Great and General Council with a two-thirds majority to a 4-year term. After the first selection one-third of the members of the court are reselected every 2 years. San Marino has honorary Consulates General in Washington, DC and New York and honorary Consulates in Detroit and Honolulu. The honorary Consulate General in Washington, DC is located at 888 17th Street, NW, Suite 900, Washington, DC 20006. The Republic of San Marino's website (http://www.visitsanmarino.com/default.asp?id=297) provides information on politics, trade, and events in San Marino. San Marino is a multi-party democratic republic. The two main parties are the Christian Democratic Party of San Marino (PDCS), and the Party of Socialists and Democrats (PSD), in addition to several other smaller parties. Due to the small size and low population of San Marino, it is difficult for any party to gain a pure majority, and most of the time the government is run by a coalition. Following the November 2008 election results, the PDCS formed a center-right coalition government with the Popular Alliance and several smaller parties. Because tourism accounts for a large part of the economy, the government relies not only on taxes and customs for revenue but also the sale of coins and postage stamps to collectors throughout the world. In addition, the Italian Government pays San Marino an annual budget subsidy provided under the terms of the Basic Treaty with Italy. In recent years banking has also become an important economic activity. Harmonization of statutes and policies with the EU is a major domestic and foreign policy priority of the republic. Another priority issue is the signing of a cooperation agreement with Italy, San Marino's most important economic partner. Manufacturing industry contributed to 33.3% of San Marino's GDP in 2009. Other important sectors included banking and insurance (17.6%); public administration (13.6%); commerce (13.5%), services (13.6%), and construction (5.9%). Tourism remained a significant activity, drawing about 2 million people annually. San Marino is an active player in the international community. Currently, the Republic has diplomatic relations with over 70 countries. 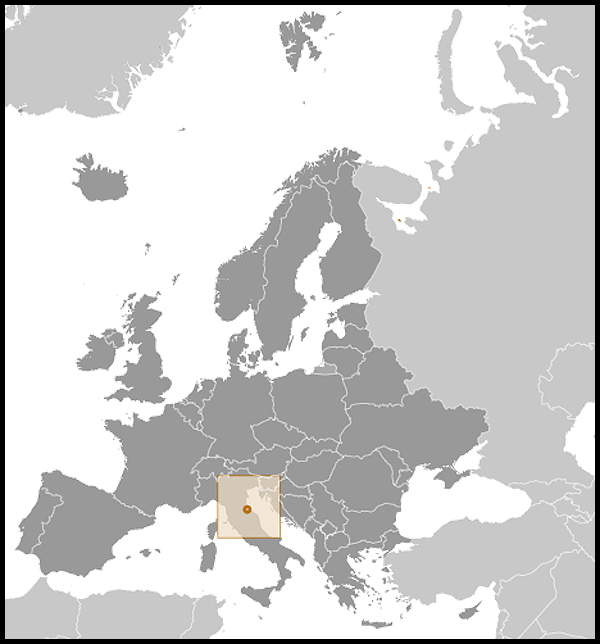 Italy is the only country represented by an ambassador resident in San Marino. The Papal Nuncio, based in Rome, is the dean of San Marino's diplomatic corps. San Marino is a full member of the United Nations (UN), International Court of Justice (ICJ), United Nations Educational, Scientific and Cultural Organization (UNESCO), International Monetary Fund (IMF), World Health Organization (WHO), World Tourism Organization (WTO), Council of Europe, International Red Cross Organization, the International Institution for the Unification of Private Law (UNIDROIIT), and Interpol, among others. It also cooperates with UNICEF and the United Nations High Commission for Refugees (UNHCR) and has official relations with the European Union (EU). From May-November 1990 and from November 2006-May 2007, San Marino held the semi-annual presidency of the Committee of Ministers of the Council of Europe, headquartered in Strasbourg, France. The United States and San Marino enjoy friendly diplomatic relations. San Marino consistently supports U.S. foreign policy positions, as well as U.S. candidates to international organizations. The two countries are on excellent terms. In December 2009 Ambassador David Thorne presented his credentials to the Captains Regent, to become the second U.S. Ambassador to San Marino in the country's history. In July 2007, Ambassador Paolo Rondelli became San Marino's first ambassador to the U.S. For consular purposes, the republic is within the jurisdiction of the Florence consular district. Consulate officials regularly visit San Marino to carry out diplomatic demarches, represent U.S. interests, and administer consular services. U.S. Consul General Mary Ellen Countryman is the working diplomatic contact to San Marino. The U.S. Consulate General (http://florence.usconsulate.gov/english/) is at Lungarno Amerigo Vespucci, 38, 50123 Firenze, Italy (tel. (39) (055) 266-951).